The Femmes Fortissimo Brass Band Concert has been postponed, due to the weather. It was due to take place 03/03 but it will now be on Sat 28 April instead (Southlands Methodist Church, York 7.30pm as before). Please spread the word. WHERE Novotel York, Fishergate, York, YO10 4FD. DESCRIPTION Need help finding the confidence to use your voice? Join Kyra and Jules Wyman, Confidence Coach, to discover practical ways to build your confidence and assertiveness in everyday life. ACCESS Meeting room is hearing loop and wheelchair accessible – please contact Kyra if you have any access requirements you’d like to discuss. Limited free parking is available at Novotel on a first-come-first-served basis. DESCRIPTION A performance poetry workshop. Writing exercises, discussion & sharing in a supportive, trans-inclusive, female-only, safe space. A fun and friendly session for all levels to guide you through creating & performing your own performance poetry. Expect writing exercises, theatre games & lots of fun with useful, positive feedback. Led by experienced workshop facilitator, theatre-maker & multi-slam winning poet Hannah Davies, Associate Artist at Say Owt Slam. ACCESS Event will be on ground floor (step free access); disabled toilets available. Lift to toilets; also disabled toilet on ground floor, accessible via staff. DESCRIPTION We will be showcasing 3 emerging female artists from Yorkshire as headliners, performing spoken word on their own experiences. We will also host an open mic encouraging female and non-binary performers to share their stories and experiences through spoken word or song, responding to the theme ‘Hear My Voice.’ We aim for an inclusive & safe environment for women to raise their voice, whether in poetry, protest or song. Get in touch at lilyluty@btinternet.com 07491390359 for more info or to book a slot before the night. ACCESS Wheelchair accessible; accessible toilets. Get in touch to discuss any requirements. We will do our best to provide trigger warnings where needed. COST £10 (£8 concessions) tickets can be reserved in advance and/or pay on the door – email organiser for preference or tel 07792 633984. DESCRIPTION Femmes Fortissimo! celebrates women’s voices through the power, passion and tenderness of brass. Female players from all of York’s brass bands and further afield have come together for this entertaining special concert, conducted by Sue Sykes (Music Director, York Concert Band). Brass bands were, for a long time, male preserves. While the gender mix is fairly equal today, there are still comparatively few women conductors, composers & adjudicators. By bringing together a massed band of female players under a female MD we are making our voices heard, loud and proud, through the medium of brass instruments. DESCRIPTION A leisurely paced ride, mainly off road along riverside path to Moorlands Nature Reserve. Stop for refreshments & chat at Skelton Garden Centre cafe. We’re keen to encourage women & girls from all backgrounds to cycle. Our core delivery team is all female, trained in ride & walk leading, bike mechanics and first aid. We pride ourselves in making our activities inclusive, safe, sociable, supportive and fun! ACCESS Our rides are accessible to most abilities (please contact yorkbikebelles@gmail.com with any queries; note we are not able to provide adapted bikes but can advise of specialist suppliers). We will stop at a cafe with toilets en route. COST £5 – advance tickets: https://www.relaxkids.com/venue/Briar-House-/731. Tickets only available on the day if spaces left. Proceeds to Kyra. DESCRIPTION ‘Just Relax’ is a relaxation session for adults. It includes various elements – yoga based stretches, self massage, breathing exercises, positive affirmations and visualizations – all designed to have maximum potential to reaching relaxation and teaching relaxation techniques. By having time to ‘self’ there is time to consolidate thoughts, self reflect, and gain energy to realize your needs and voice as a woman. COST £7 per person for a group session (all profits to Kyra) – advance booking encouraged. DESCRIPTION Learn about consensual touch with Anna Semlyen of Yoga in York. Easy tantra yoga, nurturing ourselves with easy techniques for connection. COST £4. Bookings can be made via website www.actwithamy.co.uk email actwithamy@yahoo.com 07857712699. All profits to York Women’s Counselling service. DESCRIPTION Free your natural voice and feel confident to use it! Our voices as women need to be heard and sometimes this is made difficult for us. But it’s our most important tool and mustn’t be neglected. This workshop uses practitioners who focus on the voice as part of the soul and help you work on building confidence to use your natural voice, not hold tension in your throat, face and neck so that your voice can literally be heard. We will use the floor during this workshop, please wear comfortable clothing and bring a floor mat if you’d prefer. ORGANISER wwwactwithamy.co.uk – actwithamy@yahoo.com. 07857712699. Amy – Actor Act With Amy – Workshops for all ages, abilities & aims. Unique Team Building. WHEN Monday, 5th March. Register for EITHER morning OR afternoon session. DESCRIPTION Join a workshop to make reusable sanitary wear for women and girls. Materials and instructions provided. DESCRIPTION With Cake & Coffee we will discuss sexual harm and how to prevent it. We will hear your thoughts, open & honest, and hope to raise awareness and recognise misconceptions. We will give women the opportunity to have their voices, opinions & hidden beliefs heard; to be supported; and to learn some tools to be part of the change they want to see. DESCRIPTION Learn about the history of women’s suffrage with our 30 minute talks on gallery at York Castle Museum. Find out how women fought for the vote, learn about the different tactics of suffragists and suffragettes and their male supporters, and find out how local women in York contributed towards the movement. Talks are held in the Home Front section of our exhibition 1914: When the World Changed Forever. ACCESS The whole museum is over two buildings & several floors, not all of which are accessible. The area where the talks are being held is wheelchair accessible. Accessible toilets on Kirkgate, accessible by ramp. DESCRIPTION On Tuesday 6th & Thursday 8th March join our Suffragette character, Annie Seymour Pearson, a respectable member of Heworth’s community, bringing York’s story of suffrage to life. York was comparatively late to join the Suffragette cause and little was known about this history until recent research enabled local women’s voices to be heard. Their efforts in the name of the cause involved arson, imprisonment, covert operations and bake sales. Annie’s story is brought to life as a costumed character on Kirkgate, our recreated Victorian street. From 8th March onwards, there will also be opportunity to find out the stories of women behind some of the objects on display. Although the extension of the vote to women gave them a recognised role in politics, women had always held and wielded political power prior to this even though where, how, and in what way they were able to do so had often been restricted and went unrecorded and unrecognised by history. Follow the trail of objects through the museum to uncover stories – some known, others unacknowledged – of these powerful and hidden women of history. ACCESS The whole museum is over two buildings & several floors, not all of which are accessible. Accessible toilets on Kirkgate, accessible by ramp. DESCRIPTION Beautiful & powerful exercises: Qi Gong combined with Hand of the Wind Kung Fu. Feel the power of light movements as part of a culture, that, for thousands of years, has valued the Yin, the Feminine and Womankind. Come and explore your inner warrior in this fun, friendly session! DESCRIPTION York Spoken Word has run an open mic in York since January 2006, focussing the March meeting on IWW. Share poetry, prose, song, essays or stories in warm friendly room. Our 13th Year celebrating IWW. Sign-up on the night for 5 mins or just listen. ACCESS Step-free level entry at rear of pub, wheelchair possible. Same floor (ground floor) for toilets. Cabaret seating layout. DESCRIPTION Drop in to taste premium fair organic coffee grown by women farmers working together in Nicaragua, Peru or the Democratic Republic of Congo, improving their status in society. In machismo societies in some parts of Latin America and Africa, women farmers joining together in fair trade cooperatives present a different model of how society can be organised. ACCESS Venue accessible for wheelchairs and a seat is available. No public toilet. DESCRIPTION Themed around women’s narratives about their own bodies, this evening of poetry and prose readings seeks to challenge mainstream cultural messages about ideal feminine beauty through offering alternative ways of ‘storying’ and ‘performing’ women’s bodies. DESCRIPTION Poetry reading and discussion with Pauline Kirk, Andy Boobier & Nicholas Bielby. Pauline will focus on how the idea of Time influences her work (‘Time Traveller’ pub Graft Poetry), how its passing affects us, and how we visualise the past and future. Andy Boobier, also published by Graft, will read from his collection ‘Kong King’. Nicholas Bielby, editor of Graft, will explain why he chose to publish our books. Opportunity for Q & As. ACCESS Event will be on ground floor (step free access); disabled toilets available by lift or on ground floor, accessible via staff. Hearing loop. DESCRIPTION The heart-rending story of a 16 year old Tibetan who, in desperation at the brutal occupation of Tibet by the Chinese, sets himself on fire and the effect this has on his mother and his family. ORGANISER Rowena Field – email: rfield151@yahoo.co.uk; Tel: 07552472491. Tibet Support Group York. Raising awareness about Tibet, promoting Tibetan culture and religion and fundraising for projects. DESCRIPTION A cultural evening of film, family narratives, poetry, art and photography celebrating the lives of Palestinian women. The voices of Palestinian women are rarely heard in the UK, often omitted from reports and media stories. This is an opportunity to redress that imbalance. DESCRIPTION Mixed social badminton for fun and exercise on Wednesday evenings. All abilities, but not beginners as no coaching available. It is important that women, as well as men, are involved in physical activity where possible, for social as well as mental and physical health benefits. Burnholme badminton club is currently very low on female members and is keen to recruit. All sessions are mixed, though some women’s doubles are played if sufficient numbers. DESCRIPTION Learn hula hoop skills and tricks whilst making new friends and having a giggle. Discover that you are capable of more than you ever realised. I only offer 6 places in a workshop to make sure it is a small, supportive group but am happy to put on further workshops if the first one books up. Open to all ages. ACCESS Wheelchair access, toilet on ground floor in a large room with space for wheelchairs but has not been officially certified as accessible. Venue not suitable for cat allergy sufferers. DESCRIPTION This is a repeat of the event running on Tuesday 6th March. Please see that entry for details. COST £5 – no need to book in advance. The fee is being donated to IDAS in York. DESCRIPTION From an Abbess to an angel, an author and an anchorite, join this 90 minute walking tour to hear the stories of the many significant women of York. COST £10 – tickets available on the website www.thebasementyork.co.uk or from the City Screen Box Office. DESCRIPTION An evening of spoken word and acoustic music performed by some of Yorkshire’s most powerful female voices, including: Joolz Denby and Hannah Davies. The event will raise money for Independent Domestic Abuse Services, who support thousands of people each year in Yorkshire. ACCESS The Basement has good access. For more info or questions please email cityscreenyork.basement@picturehouses.co.uk, or inform the staff on the night. ORGANISER Carmel Offord, Independent Domestic Abuse Services (IDAS) – supporting people affected by domestic abuse and sexual violence, 90% of whom are women. Contact info@idas.org.uk 07967 273547 for more information. DESCRIPTION Rachael Maskell, York’s first ever woman MP, will be speaking on ‘Women and Power’ focusing on building women’s confidence and courage to speak out, and how challenges facing women in York and beyond can be tackled. She will also be giving us an insight into her experiences of the world of women in Parliament. ORGANISER Womensofficeryork@gmail.com; although this is organised by the Women’s Forum of York Labour Party, it is a non party political event. WHEN 6.30-9pm, Saturday 10th March (doors open at 6) (also Sat 10th & Sun 11th). DESCRIPTION ‘SL*T’ is an exploration of the way women’s bodies are policed in the public and private sphere, the conflicting messages sent about body image and sexuality by the media and society and the violence faced by modern women in daily life. It will comprise verbatim materials, spoken word and movement sequences collected and developed throughout our Research and Development stage from local women and organisations. The interview testimony has been put straight into the play, putting women’s voices at the forefront. Performing with a strong group of female actors we will shout, scream and whisper the words of real women and ourselves, responding to a culture that polices our bodies and expects us to be both desirable and pure at the same time. We will protect the identity of those involved, allowing their words to be heard without repercussion in a safe, empowering environment. ACCESS Accessible entrance; level access seating available. Toilets on ground floor but no handrails & limited in space. No hearing loop or BSL interpreter. Please book in advance or email theshriekingsisters@gmail.com with any accessibility requirements so we can reserve specific seats for you & your party and try to accommodate your requirements. ORGANISER The Shrieking Sisters are a not-for profit, female-led theatre company based in York. We believe theatre is an instrument of social change and want to represent voices of those who feel marginalised by society, bring community to the isolated and create strong, female-led theatre that doesn’t f*** about. 40% profits to the sexual abuse charity ‘Survive’ plus donations on the night. DESCRIPTION An uplifting film about empowerment, recovery & passion for life. This feature film peers into the Kaleidoscopic mind of renowned artist Ginny Ruffner, illuminating her journey from a near-fatal accident to re-invention of her world. She challenges us not to waste a minute of our lives and see the world from an unexpected perspective. “I think the universe has a finely tuned sense of humour” says Ginny. Directed by Karen Stanton, Produced by Tom Gorai. COST £10 – and all donations welcome. Please book a place by contacting Laura. DESCRIPTION Iyengar yoga class emphasising alignment for the health of body, breath and mind. Suitable for beginners and those with experience. Benefit for UK Friends of Khwendo Kor (www.frok.org.uk) raising awareness of the work of FROK and the women it supports in northwest Pakistan. ACCESS This class is open to all – Iyengar yoga uses props to enable everyone to benefit from yoga. Clements Hall is wheelchair accessible, accessible toilets & hearing loop. COST This full day of talks is FREE to attend; it is run by businesswomen who charge for any services that might be subsequently undertaken after the event. No need to book; just turn up. ORGANISER The Art of Living and Dying – local, self-employed women helping each other get our voices heard about significant life choices. Email questions to Sarah Jackson: sarah@winifredtaylor.co.uk. Or call Chris Dudzinska: 07824 639244. COST FREE, but tickets should be booked in advance from womensofficeryork@gmail.com or via Eventbrite Places only available on the door if any spaces left. DESCRIPTION An ambitious work-in-progress aiming to tell the untold (or not sufficiently told) stories of 100 women ‘Change Makers’ active in York between 1918 and 2018 – women who have inspired others, challenged the status quo, and changed society for the better. The event will explain how the project started, what we have discovered so far (with individual examples) and our plans to make these women visible! DESCRIPTION Join us for an afternoon of music and visual arts exploring what activism means for women human rights defenders. We host human rights defenders from across the world, all working in very difficult environments. This event explores what activism means for women human rights defenders working across the globe. Art works and music created by visiting human rights defenders at the Centre for Applied Human Rights, together with Newcastle based Afro-Latin percussion & brass duet ‘Ladies of Midnight Blue’ and Kenyan multi-instrumentalist Rapasa. Opportunity for Q&A with the activists and artists. ACCESS Venue is wheelchair accessible and has accessible toilets. COST £7 per ticket (includes tea, coffee and cake). Advance tickets from eventbrite– details here www.facebook.com/trulyyouuk. Tickets only available on the day if there are any left. DESCRIPTION Uplifting event to speak out against negative body image. Join us for motivational talks from women who work to empower others and celebrate you as you truly are right now. Sam worked as a hair stylist for 14 years, increasingly aware of how much women focus on appearance to detrimental effect, holding them back from their true potential. Through her campaign she helps women speak about everything they are truly amazing for, their achievements, creations, children, homes, travels, careers – to celebrate all that they are, right now as they are. ORGANISER Sam Mason – trulyyouuk@gmail.com. Truly You is a social media campaign promoting positive body image & self confidence. WHEN 6.30-9pm, Saturday 10th March. NOTE: this is a repeat performance: for full details see entry on Friday 9th (performance also on Sun 11th). DESCRIPTION Semi autobiographical story of the everyday life of a Saudi schoolgirl, revealing scant opportunities for change and obstacles encountered every day as a female. Shining example of artistic work that has made a woman’s creative and political voice heard globally. This historic first ever cinema feature film directed by a Saudi Arabian woman became an international award winner. We also hope to include live discussion with a modern young Saudi Arabian woman on her own experiences of life in her culture. ORGANISER Cinem@Explore: Community Cinema Events Production. Facebook: “cinescreenings“; twitter: “@cinescreenings” – follow/like for ticket info. WHEN 6.30-9pm, Sunday 11th March. NOTE: this is a repeat performance: for full details see entry on Friday 9th. COST £3.00 (includes tea & cake). Tickets on the door. DESCRIPTION Bring minimum 3 items of good quality clothes (sized if poss), shoes or accessories. Pay £1 for each ‘new’ item you take. Jewellery stall; Raffle; documentaries about the work of Khwendo Kor, a rights based organisation in deeply patriarchal NW Pakistan whose core aim is to give women and girls a voice. ACCESS Wheelchair access. Accessible toilets. Hearing loop. Contact us for any other needs. COST £20 standard, £10 low income. Women only event. DESCRIPTION A one day conference to mark and celebrate the centenary of (some) women getting the right to vote (over 30, with property) in 1918. 100 years of progress? 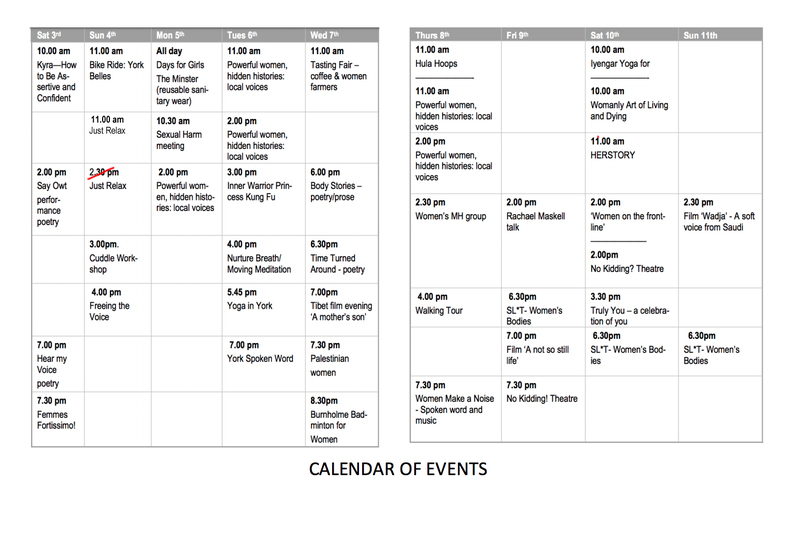 A programme of panels and workshops, drama (an excerpt from ‘Maiden Speeches’ by Hannah Davies) and film, including national and local speakers from: The Fawcett Society, The Women’s Budget Group, Joseph Rowntree Foundation, University of York, Howard League for Penal Reform, IDAS, and Together Women. A day to inform, educate and inspire! ORGANISER womensofficeryork@gmail.com. Although this conference is organised by the Women’s Forum of York Labour Party, it is non party political and open to all interested women in York and Yorkshire.